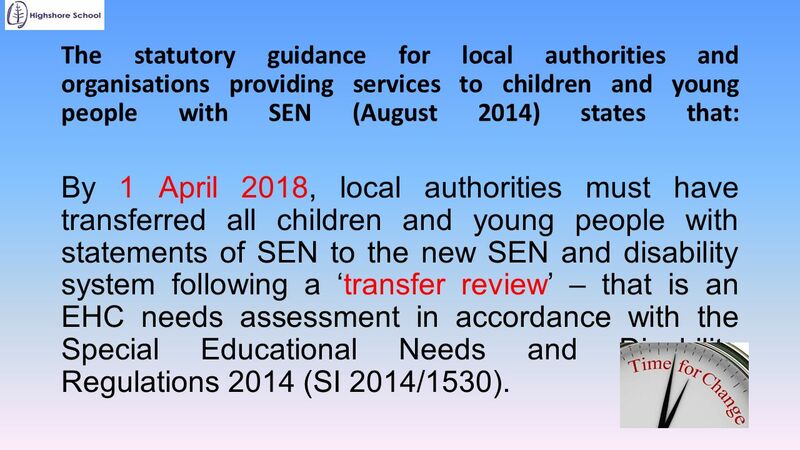 2 The statutory guidance for local authorities and organisations providing services to children and young people with SEN (August 2014) states that: By 1 April 2018, local authorities must have transferred all children and young people with statements of SEN to the new SEN and disability system following a ‘transfer review’ – that is an EHC needs assessment in accordance with the Special Educational Needs and Disability Regulations 2014 (SI 2014/1530). 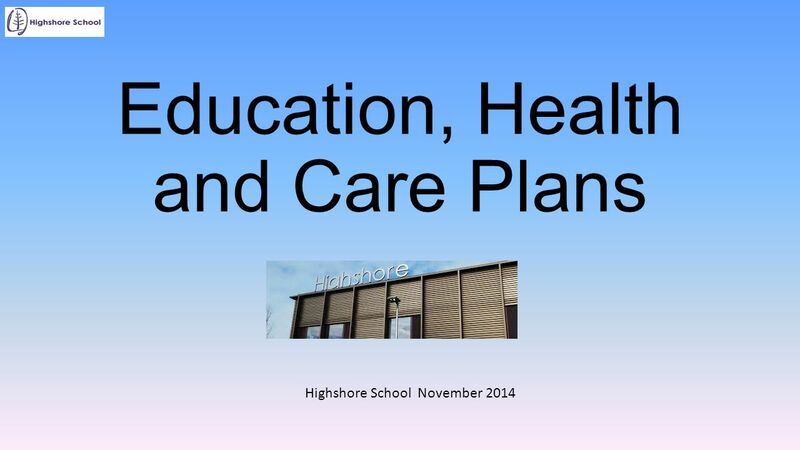 3 What is an Education, Health and Care plan? 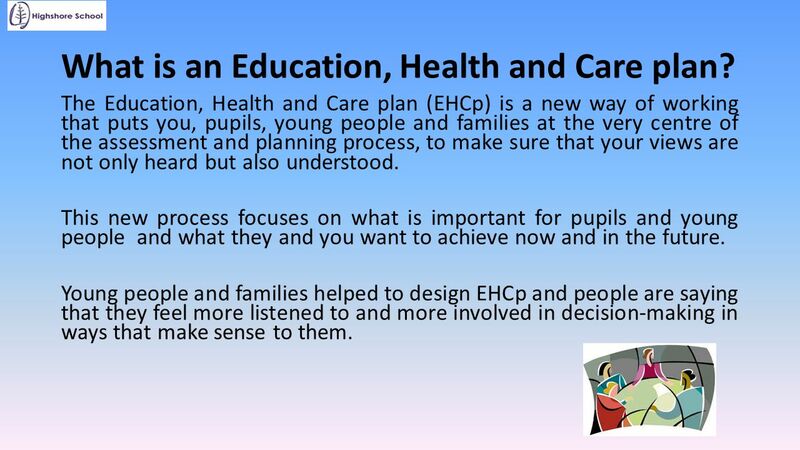 The Education, Health and Care plan (EHCp) is a new way of working that puts you, pupils, young people and families at the very centre of the assessment and planning process, to make sure that your views are not only heard but also understood. This new process focuses on what is important for pupils and young people and what they and you want to achieve now and in the future. 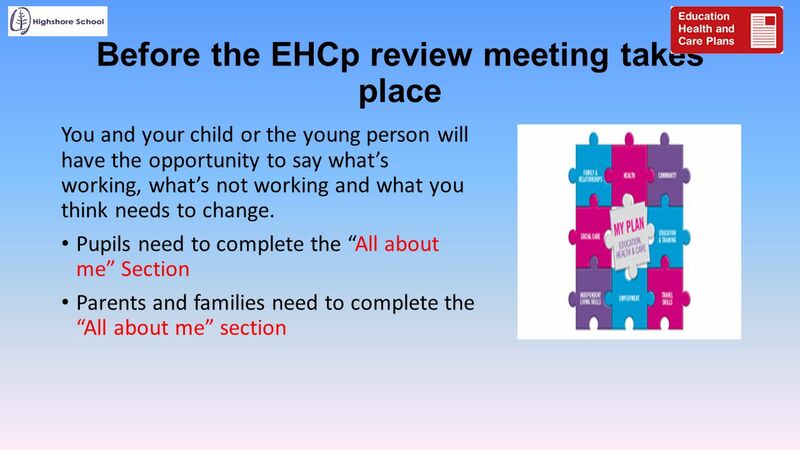 Young people and families helped to design EHCp and people are saying that they feel more listened to and more involved in decision-making in ways that make sense to them. 5 How will this happen? 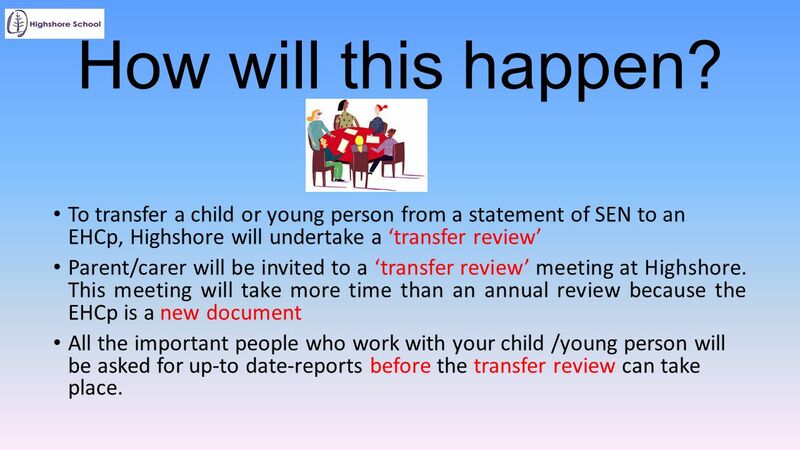 To transfer a child or young person from a statement of SEN to an EHCp, Highshore will undertake a ‘transfer review’ Parent/carer will be invited to a ‘transfer review’ meeting at Highshore. 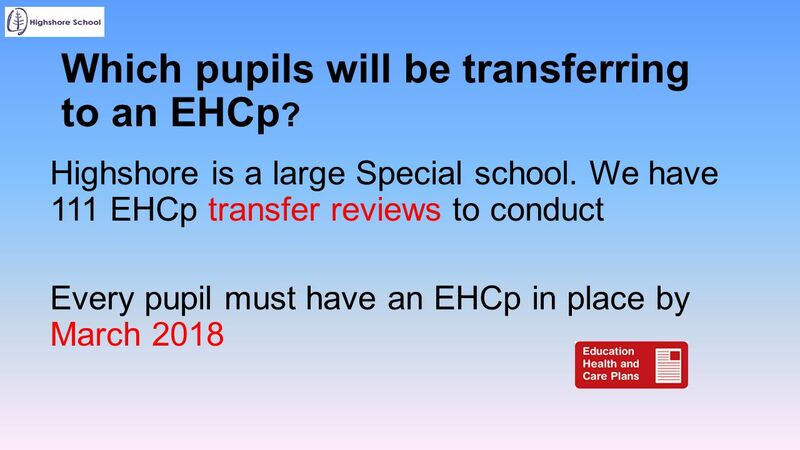 This meeting will take more time than an annual review because the EHCp is a new document All the important people who work with your child /young person will be asked for up-to date-reports before the transfer review can take place. 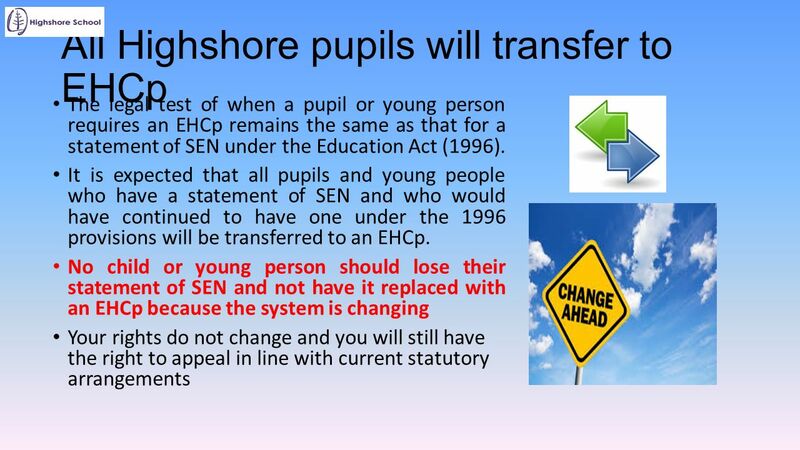 6 Which pupils will be transferring to an EHCp? 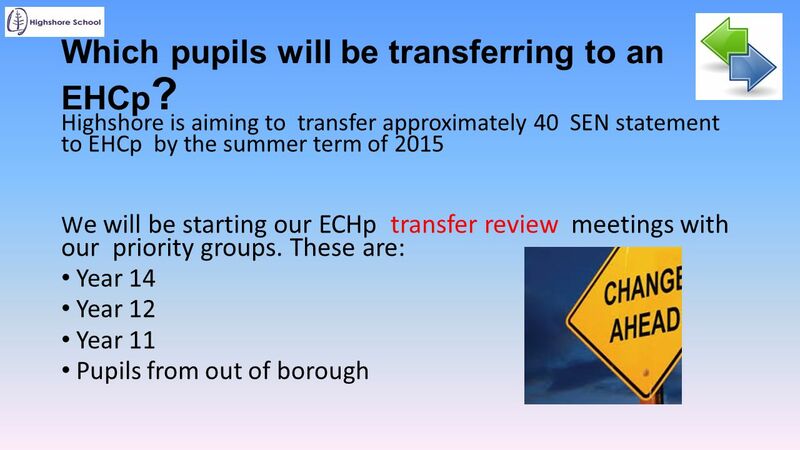 7 Which pupils will be transferring to an EHCp? 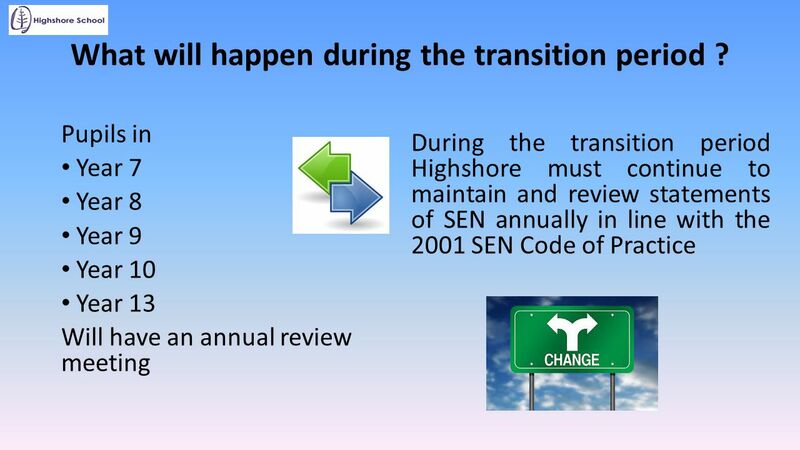 8 What will happen during the transition period ? 9 How might this affect the support my child or young person receives? 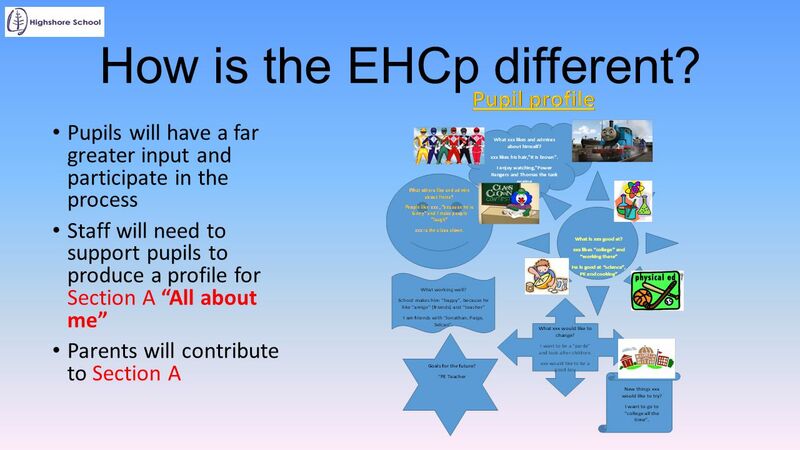 10 How is the EHCp different? 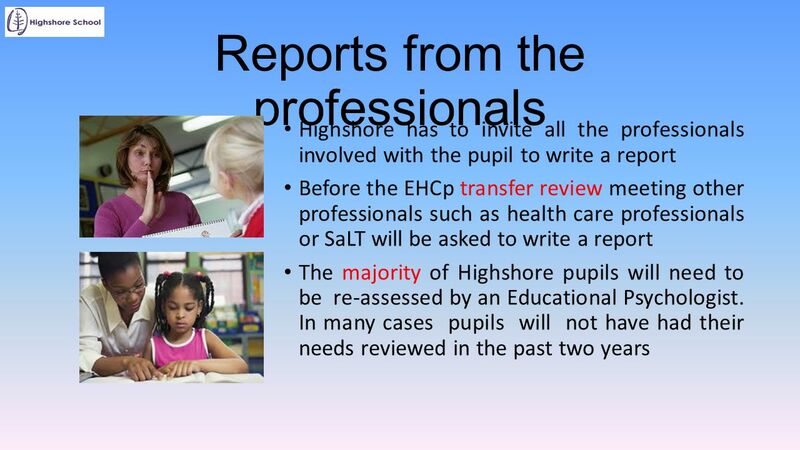 The EHCp will cover all the pupils’ needs and brings different services together. 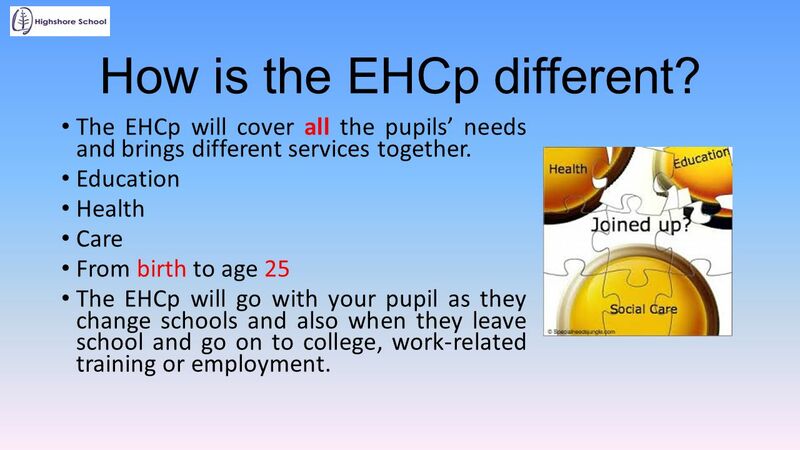 Education Health Care From birth to age 25 The EHCp will go with your pupil as they change schools and also when they leave school and go on to college, work-related training or employment. 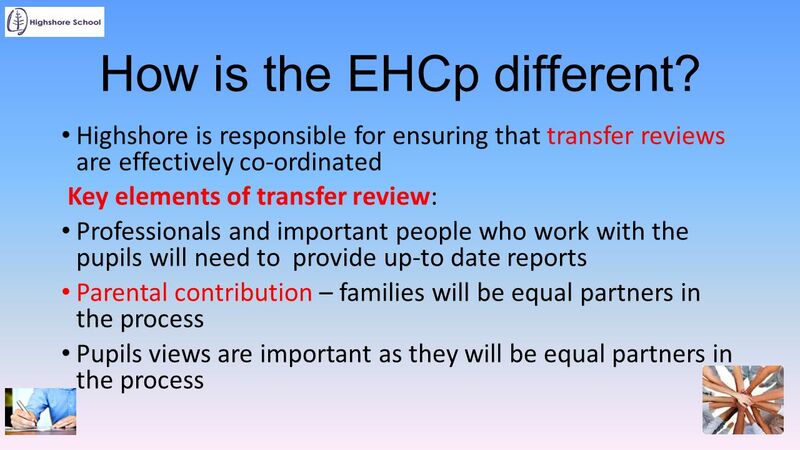 11 How is the EHCp different? 12 How is the EHCp different? 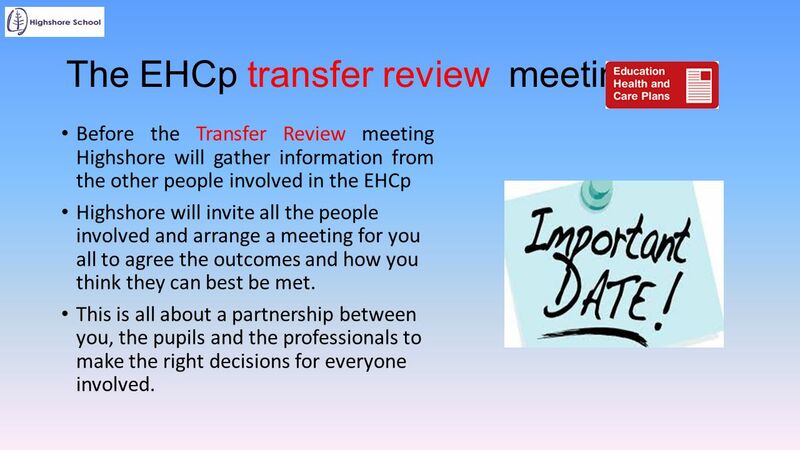 Before the Transfer Review meeting Highshore will gather information from the other people involved in the EHCp Highshore will invite all the people involved and arrange a meeting for you all to agree the outcomes and how you think they can best be met. This is all about a partnership between you, the pupils and the professionals to make the right decisions for everyone involved. 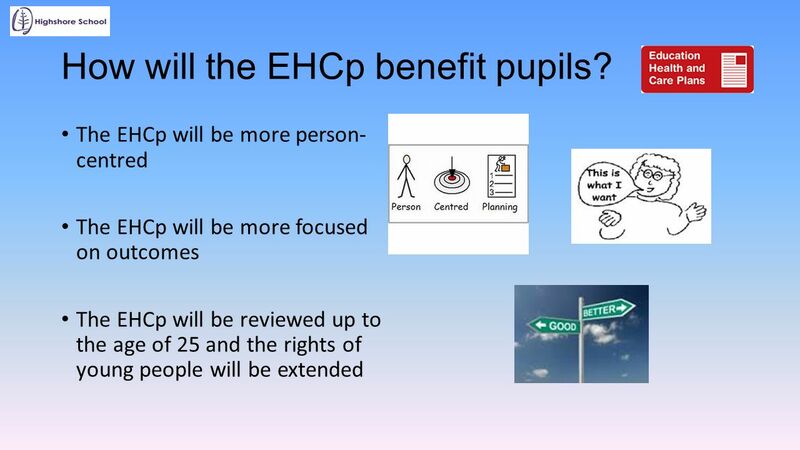 17 How will the EHCp benefit pupils? 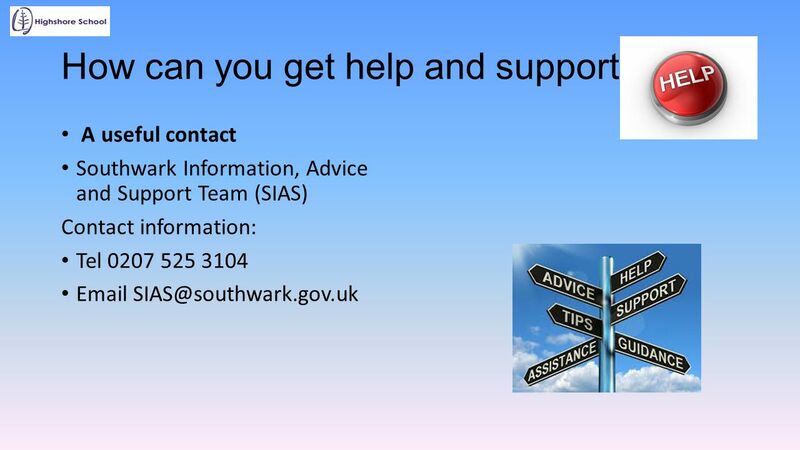 18 How can you get help and support? Download ppt "Education, Health and Care Plans"
SENCo Network Meeting Wednesday 15 th January 2014. An Introduction to Special Education Needs and Disability Reforms East Sussex Parent and Carers Council with East Sussex County Council March 2014. POST 16 PROVISION Brian Lamb. Post 16 Provision must cover: how local authorities and health services should plan strategically for the support children. Children and Families Act 2014: SEND Reforms County Governor Forum Tuesday 4 November 2014 Liz Flaherty. The Big Policy Picture BOND National Conference London, Wednesday 6 th November 2013 Matthew Hopkinson SEN and Disability Assistant Deputy Director, DfE. The Draft SEN Code of Practice November What the Code is Nine chapters Statutory guidance on duties, policies and procedures relating to Part 3. Changes to the Special Educational Needs system Somerset’s Local Offer Education Health and Care Plans Annual Reviews and the transfer of statements to. The SEND reforms and Independent Support 13 th March 2014. Parent carers and their role in the SEND reforms. Education, Health and Care Plans Conversions. Background  We currently have over 800 pupils with Statements in West Berkshire  We also provide funding. SEN Reform Update for Head teachers September 2014 David Carroll SEN/Inclusion Lead & Principal Educational Psychologist. Education Health and Care Plans – the impact on learners and their transition into Post 16 Michelle Docking, Manager of Statutory Assessment and Resources. SEND Reform in West Berkshire Briefings for parents, schools and practitioners July 2014. New System – What is an EHC Plan? From 1 September 2014 statements of special educational needs and Learning Difficulty Assessments will be replaced by.